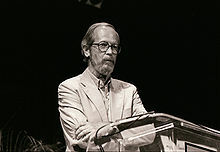 AUTHOR Elmore Leonard is not gunning for metaphors in his witty advice on writing style. Leonard’s bum rap on this may come from confusing the author’s dicta with another piece of counsel from George Orwell, the Master of the Metaphor. “Never use a metaphor, simile, or other figure of speech which you are used to seeing in print,’’ Orwell wrote. He could have saved himself a stack of words by saying never use a cliché. I suspect Gallant was being facetious as most books contain hundreds of metaphors. Almost every invective and profanity is a metaphor. Here is one line from The Lord God Bird. It has two metaphors “gentle light” and “hint of friendship.” They are the two powerful images of the sentence. Methinks, Mr Gallant makes mischief with his metaphoric comment. So what is the valuable advice to writers about metaphors? Orwell’s is for a start. Over my years in journalism, I have lost count of the times newspaper editors have “improved” my copy with the insertion of clichés in my intros. The second is metaphors and especially similes can break the golden rule of “show don’t tell’’. 3 Never use a verb other than "said" to carry dialogue. 4 Never use an adverb to modify the verb "said"
5 Keep your exclamation points ­under control. 6 Never use the words "suddenly" or "all hell broke loose". 7 Use regional dialect, patois, sparingly. 8 Avoid detailed descriptions of characters. 9 Don't go into great detail describing places and things. 10 Try to leave out the part that readers tend to skip. He could have added rule 11 “Every literary rule needs to be broken”. Today, Friday, 25 January, (US time) is the last free day for the ebook of my novel Iraqi Icicle. You have probably guessed the title is a metaphor. You can help by downloading and spreading the word across your social networks. Below are the links you can insert in tweets and posts. Thanks. All week, Iraqi Icicle has been in the Kindle Top 100 for humor Freebies. Let’s finish with a bang and I will be King of the Read.